First crop weanling sire Peace and Justice held the top two spots in Timonium, Md. 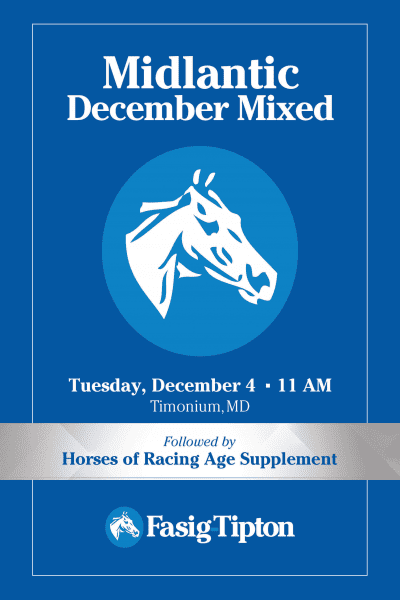 on Tuesday at the Fasig-Tipton Midlantic December Mixed & Horses of Racing Age sale. The sale topper was a colt from the first crop of Peace and Justice. LEB purchased Hip 141 for $87,000 from the consignment of Northview Stallion Station, agent. The dark bay or brown colt was bred in Pennsylvania by A1A Racing. Peace and Justice is also responsible for Hip 145, a colt purchased for $80,000 by Nick Sallusto, agent. That colt, the second-highest price of the day, was also bred in Pennsylvania by A1A Racing and consigned by Northview Stallion Station. A filly from the second crop of current leading freshman sire Cross Traffic led yearling sales. Offered as Hip 211 by Gracie Bloodstock, agent, the top-priced yearling was purchased for $30,000 by Al Klerlein III. The gray or roan filly, out of a full sister to multiple champion Sulusito, was bred in South Carolina by Jim Brinkley. Line of Best Fit (Hip 60), a Grade 1-placed stakes winner by Trajectory, led broodmare prospects when sold for $33,000 to Joseph Besecker from the consignment of Bill Reightler. The 16-time winner, third in last year's G1 Delaware Handicap, earned $658,690 in 46 career starts. Carlos S.E. Moore, agent paid $30,000 for Look Who's Talking (Hip 63), the sale's top broodmare. Offered by Becky Davis, agent, Look Who's Talking is a stakes winning daughter of Cape Blanco (IRE) offered carrying her first foal by young sire Buffum. For the second year, the Midlantic December Mixed sale featured a Horses of Racing Age Supplement. Among racehorses offered, 2-year-old gelding Halstaat (Hip 269) fetched the top price when sold to Carlos Martin, agent for $50,000. Halstaat, a son of Munnings from the family of talented juvenile Caller I.D., was previously campaigned by owner Three Diamonds Farm and trainer Mike Trombetta. Overall, 201 horses sold for $1,911,100 for an average of $9,508 and a median of $5,000. The RNA rate was 22%. Compared to last year's sale, excepting the DASL dispersal, the gross rose 6% and the median rose 25%, with an average in line with 2017 figures. This entry was posted in Bloodstock and tagged A1A Racing, Al Kerlein III, becky davis, bill reightler, carlos martin, Carlos S.E. Moore, cross traffic, fasig-tipton, Fasig-Tipton Midlantic December Mixed Sale, Gracie Bloodstock, Halstaat, joseph besecker, LEB, line of best fit, Look Who's talking, mike trombetta, Nick Sallusto, Northview Stallion Station, peace and justice, three diamonds farm by Edited Press Release. Bookmark the permalink.